Fifty years after the launch of Martin Luther King's final unfinished campaign, a "fusion of movements" aims to save the "heart and soul" of democracy. The air in Raleigh, North Carolina was bitterly cold on New Years Eve, but the chill did not stop hundreds of people from gathering for a mass community meeting at the Pullen Baptist Memorial Church. Inside, the band was warming up on stage and friends called out greetings to each other as they went into the main hall. A group of Raging Grannies filled a pew at the front, wearing floppy hats adorned with activist badges. 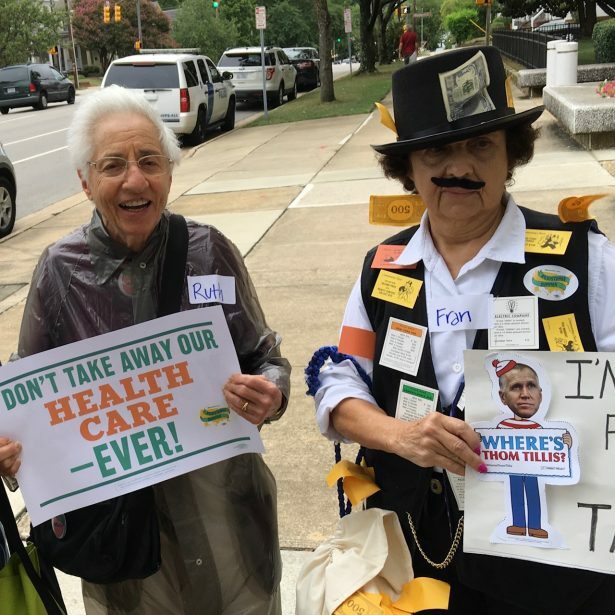 Locals from North Carolina greeted activists who had traveled from around the country to attend. Some of them had recently been arrested together for protesting the tax bill on Capitol Hill. As speakers began addressing the audience, people in the crowd linked arms and audience members flocked on stage to sing “We Shall Overcome” and chant “Forward together! Not one step back!” Together, the crowd assembled in Pullen rang in 2018 with a commitment for the coming year: to lead a nationwide campaign to save the “heart and soul” of American democracy. 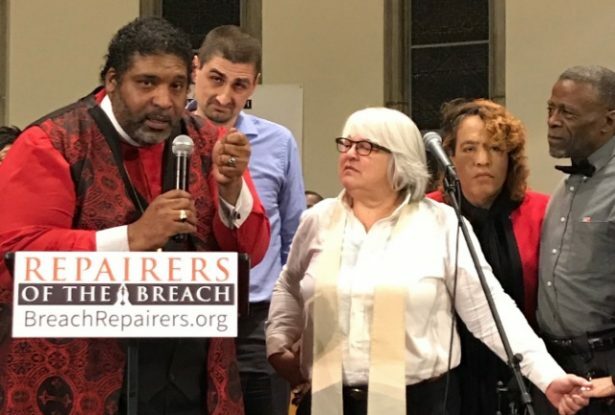 Officially titled “The Poor People’s Campaign: A National Call for Moral Revival,” the campaign’s objective is to train a massive network of grassroots activists to spark a multi-fronted movement challenging four systemic “evils” in American society: poverty, racism, ecological devastation and the war economy. A towering, imposing figure, Barber has been described by activist and professor Cornel West as a modern-day Martin Luther King, Jr. It is easy to draw the parallel, as the Poor People’s Campaign itself is named after an initiative King announced months before his assassination. The campaign is considered an unfinished part of his legacy — a movement seeking to unify people across racial lines around the shared poverty and structural inequalities they experience. The formal launch of the contemporary Poor People’s Campaign was held exactly 50 years after King announced the campaign in 1967 and is gearing up to be the largest nonviolent mobilization in the United States this year. Building on years of organizing within the state of North Carolina, leaders of the Poor People’s Campaign will spend the next five months training, educating and mobilizing communities around the country. Then, on Mother’s Day, the campaign will begin 40 days of widespread civil disobedience, nonviolent direct action and voter education. The movement aims to draw in labor unions, farm workers, civil rights groups and marginalized communities from around the country, focusing each week on a specific issue of injustice. Each week will include specific policy demands and voter education programs at the state and federal levels, as well as training in nonviolent direct action and civil disobedience. By organizing through local and state chapters, the campaign will maintain a relatively decentralized structure guided by a set of core principles and targets. One of the major strengths of the Poor People’s Campaign is its potential to appeal to Americans across party lines. It aims to unite the grievances of the marginalized white working class with marginalized communities of immigrants and people of color throughout the country. Barber says this division has kept poor whites and people of color from coming together in common cause for generations. Organizers of the campaign promote a narrative that reaches out to rural or working-class whites — a discourse often employed by politicians on the right, while also emphasizing opposition to sexism, homophobia and racism that are more traditionally territory of the left. Quartararo and his wife Elena Ceberio said they are willing to be involved in supporting the campaign in any way, and have both already been arrested for civil disobedience actions with Barber and others. They say they prefer to stay “in the background” and out of the spotlight, and they enthusiastically promote the movement within their social circle. This year, for example, the couple’s Christmas card featured a photograph of themselves with their son, all clad in black Poor People’s Campaign T-shirts, with a message asking their friends to lend their support. King’s dream was “to bring everybody together,” Quartararo said, and he hopes to draw in people from all walks of life to participate. References to King are frequent among national and state-level campaign leaders, and much of the movement’s popular legitimacy draws on this connection. The original Poor People’s Campaign, spearheaded by King and the Southern Christian Leadership Conference, sought to bring together people living in poverty across the country in a new March on Washington. The march was intended to pressure Congress and the Johnson administration to pass comprehensive anti-poverty legislation, as well as demand jobs, healthcare and affordable housing. 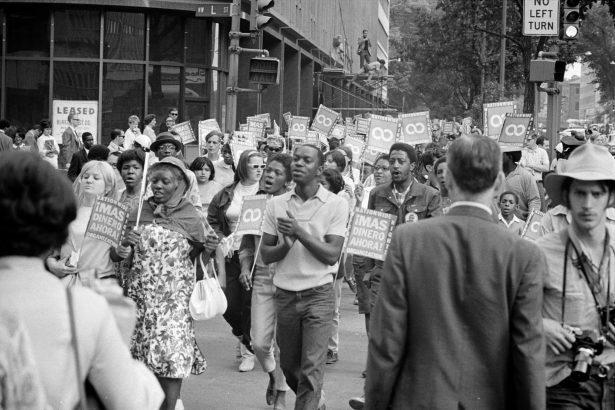 Unlike previous campaigns to fight for the civil rights and voting rights of African Americans, the Poor People’s Campaign addressed issues affecting poor people of all races. In April 1968, just weeks before the march was scheduled to take place, King was assassinated in Memphis, Tennessee. Rev. Ralph Abernathy was put in charge of organizing the march in his place, along with a group of other civil rights leaders, such as Rev. Jesse Jackson. The march began on Mother’s Day, May 12, 1968, when Coretta Scott King began a two-week-long protest demanding an Economic Bill of Rights. Five thousand protesters descended on the National Mall during the campaign’s first week and built a protest camp called “Resurrection City.” But the encampment was plagued by ceaseless rain, and its inhabitants were ultimately expelled in the middle of the night on June 20. As a result, the campaign has since been considered an unrealized part of King’s dream. Today, the Poor People’s Campaign aims not only to revive this decades-old dream, but also to reenergize many of the activists who were engaged in the anti-war and civil rights movements in the 1960s and ‘70s. David Freeman, who dropped out of high school to join the Poor People’s Campaign in 1968, has played an active role in other Barber-led campaigns. “I know of no organization, past or present, which engenders the same passion and commitment over as broad a coalition as [the Poor People’s Campaign],” Freeman said. Supporters like Schindler, Quartararo and Ceberio learned about the Poor People’s Campaign through a series of actions in North Carolina targeting reforms on the state level, which had been organized by Barber and other progressive groups around the state. After the Republicans won a majority in North Carolina’s state legislature in 2010 and the governorship in 2012, Barber launched the Moral Mondays movement in April 2013. He led protests bearing “moral witness” to the state legislature’s far-right agenda, which included attacks on health care, women’s rights, LGBTQ rights and voting rights throughout the state. 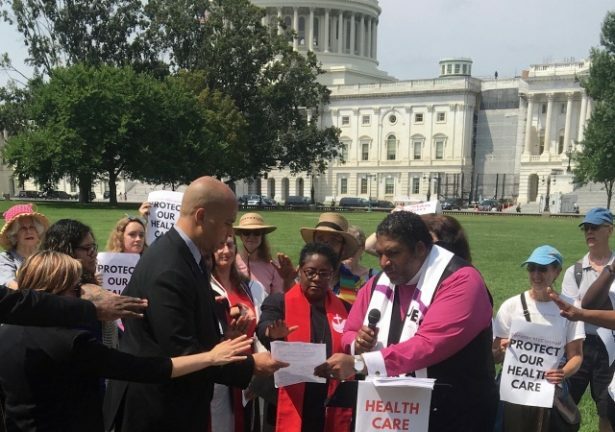 The movement gained momentum when 17 people were arrested at the first Moral Monday demonstration in the summer of 2013. Within months, there had been over a thousand arrests, sparking more actions throughout North Carolina. These included the “Tuesdays with Tillis” demonstrations outside Sen. Thom Tillis’ office in Raleigh and the “Air Horn Orchestra” demonstrations every Wednesday outside Gov. Pat McCrory’s mansion, protesting issues like gerrymandering and environmental degradation. Barber became a leading figure of progressive resistance in the North Carolina NAACP, the organization’s second largest state chapter, while serving as its president for 11 years. Barber stepped down in May 2017 to join Presbyterian Rev. Liz Theoharis in co-chairing the Poor People’s Campaign. 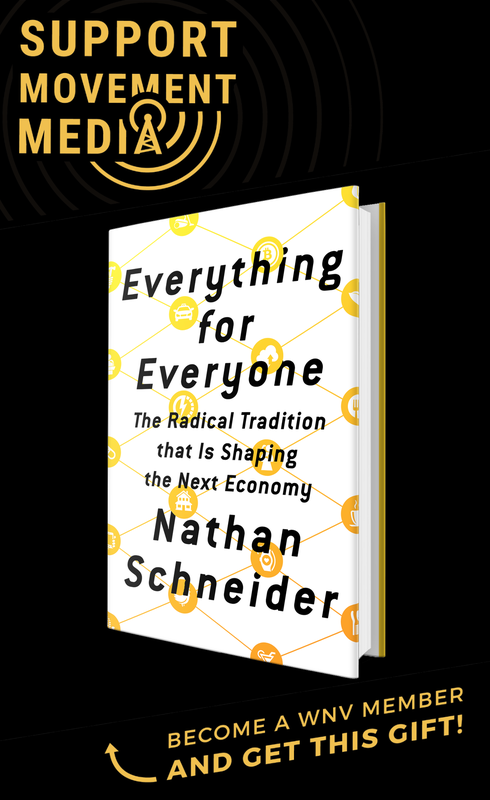 Theoharis runs the New York-based Kairos Center for Religions, Rights, and Social Justice and is the founder of the Poverty Initiative. Although Theoharis often speaks at mass meetings and Poor People’s Campaign events, she is less visible in the public spotlight than Barber, who was more involved in state-level organizing in the years leading up to the campaign launch. Barber is also known for his role as head of the non-profit organization Repairers of the Breach and for leading the “Forward Together” movement, which began organizing the annual Moral March to the Raleigh statehouse every February, also known as the Historic Thousands on Jones Street, or HKonJ. The march is put on by the HKonJ People’s Assembly Coalition, a group comprised of over 125 North Carolina NAACP branches, youth councils and college chapters, as well as representatives from over 200 other social justice organizations. The march has produced some of the largest civil rights gatherings in the South since Selma and Birmingham, and will take place again this February. One of the campaign’s strengths, aside from a strong foundation in grassroots organizing, is its aim to draw together many smaller organizations and campaigns into what Barber calls a “fusion of movements.” Back in 2014, in the early planning stages of the campaign, over a hundred leaders from more than 40 organizations began holding strategic dialogues to plan the Poor People’s Campaign, and it has been seen as broadly encompassing many other movements ever since. The campaign has so far succeeded in drawing in many smaller groups, like the Pennsylvania-based March on Harrisburg. Community organizer and march leader Kyle Moore was inspired to join the coordinating committee for the Pennsylvania state chapter of the Poor People’s Campaign after he was arrested with Barber in July. Moore was a key organizer of the March on Harrisburg, a group that held a 105-mile march from Philadelphia to the Pennsylvania state legislature in Harrisburg in May 2017. 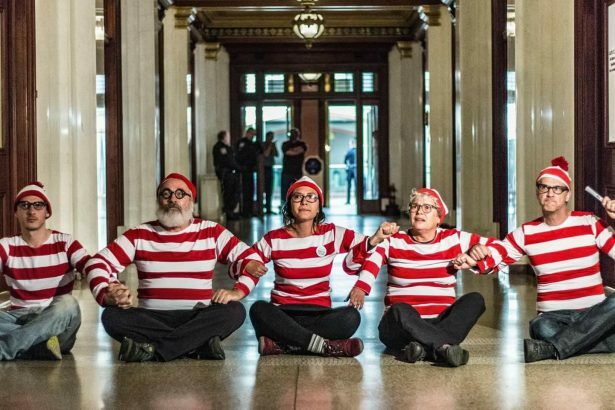 The same group was also arrested in November, when they dressed up as the “Where’s Waldo” character to make the point that it is easier to find Waldo than elected officials. They were also drawing attention to issues of gerrymandering, voter suppression and political corruption at the state level. While the campaign is garnering substantial enthusiasm in local and state chapters, as well as painting a compelling narrative of unity among marginalized and disenfranchised groups in America, many hurdles remain. Organizers will be pressed to forge a movement among diverse interest groups, develop a clear strategy with attainable goals, and maintain the enthusiasm of early supporters while also drawing in new participants. What’s more, they face the same problem as the original Poor People’s Campaign: having a single charismatic leader as the face of the movement. If such figures become unable to lead, as we have seen, the campaign can lose momentum and direction. I didn’t see any mention of ecological crises (too many to list) and militarism. 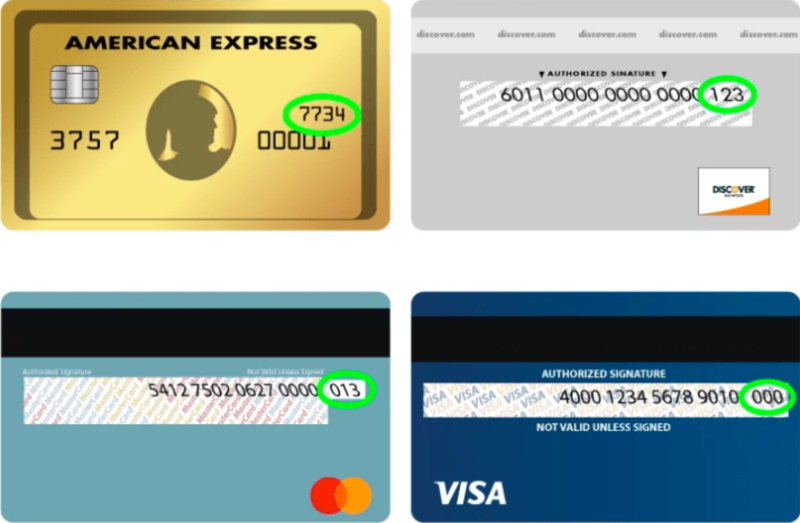 Is this campaign going to address these as one is definitely a major result of the other. I think this is fabulous, and I look forward to participating. But left wondering – where is patriarchy in the list? The women’s marches are mentioned – but not women’s oppression. The article is tagged with “women’s rights” — but where is it in the campaign? #MeToo and #Time’sUp are raging — yet Rev. Barber’s “Repairers of the Breach” Moral Agenda does not include a section on women, only sporadic mentions. To his credit, though, he *did* talk about women on Democracy Now! (DN!). The Moral Agenda also sources its authority partly in biblical (and yes, Koranic) quotes and partly in the Constitution. For those of us who are not religious, and at a time of theocratic resurgence, this is a problem, particularly considering that these are both patriarchal religions (and that the U.S. constitution was designed to protect property rights, including slavery). I guess we have work to do inside the movement (hey; what’s new?!). I will be looking to Keeanga Yamahtta Taylor’s new anthology, “How We Get Free,” which draws lessons from the Combahee River Collective (Black queer women’s) statement of 40 years ago, for inspiration – and direction. Watching Rev. Barber on DN!, I notice he emphasizes the language of policy. On the one hand, this is pragmatic; I get it. By contrast, “patriarchy” (for example) is abstract and not part of our daily lexicon (may be perceived as ‘elite discourse.’) But we need to include it, and we need to beware the limitations of a “rights-based” framework (which I think of as connected to fights over “policy”). Rights are granted by the state, and drawing the state in to enforce rights can be a double-edged sword (sharper when it cuts against people of color). Or, we try to make rights ‘inalienable’ by saying they come from “God.” I understand the important historical role of the black church in promoting Black freedom. Yet I feel the need for some other way to talk about both freedom and community that does not require some external authority (whether “God” or the state) to grant us our “rights,” and does not separate us and our kin and communities into silos. I agree with most if not all that you stated. I think there should be equal focus on patriarchy, & misogyny as other goal foci they mentioned. I also think that the religious overtones might turn a some folks off…. However, perhaps the Repairers are overwhelmed with the task they have taken on with little resources to address all issues? I’ve tried contacting them but …no one has responded yet. in my interactions with organizers of the Poor People’s Campaign, women and queer folks were highlighted. Rev. Liz Theoharis is co-leading the campaign with Rev. Barber. The importance of resisting patriarchy within our own organizing is likewise highlighted. And finally, in the audit (which I posted a link to in response to Shannon’s comment) the effects of poverty, militarism, institutional racism, and the war economy on women and queer people are specifically discussed. I hope you will join us in this campaign!